"Our challenges today are different from those of our ancestors. Many of them lived lives of poverty and hardship; some among us, however, are affluent and complacent. Wealth, abundance, and easy living do not help us develop the ability to flourish when faced with the rigors and reversals of life. Rather than seeking ease, we must plant, cultivate, and nourish within ourselves the seeds that will enable us to withstand the winds and heat of temptation, sin, and evil and that will help us live successful, happy, and pure lives. Let us consider a few such seeds. "I bear my testimony that we can plant in our hearts and minds the seeds I have mentioned, and others. If we will plant them and nurture them, we can be true, faithful, and happy regardless of adversity and the buffetings of Satan." 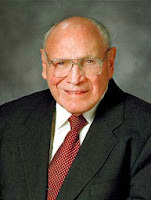 When these seeds are planted and nourished into a vibrant, living faith, Elder Wirthlin promises "we can be true, faithful, and happy regardless of adversity and the buffetings of Satan." 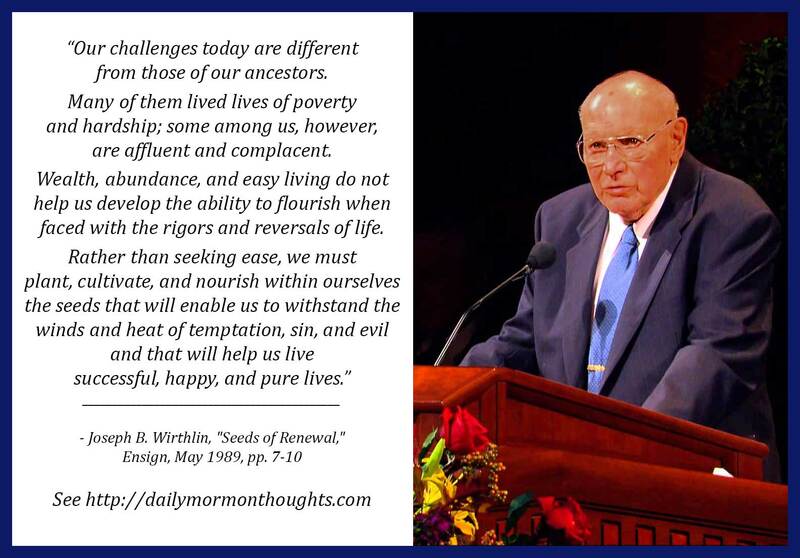 Labels: faith, strength, Wirthlin Joseph B.